The Long Beach College Promise is a nationally renowned partnership among the Long Beach Unified School District, Long Beach City College and CSULB. The College Promise offers Long Beach’s youth pathways from pre-K through college and onto careers, including one tuition-free year at LBCC and guaranteed admission to CSULB for qualified Long Beach students. “The Long Beach College Promise saw me through many experiences – good and bad – over the course of my youth,” said Vera, who graduated from CSULB in 2014 with a bachelor’s degree in business administration. It was the College Promise that gave her the support she needed to achieve her dreams of a college degree. So when she received an invitation from the first lady inviting her to testify before White House and Capitol Hill officials about how the Long Beach College Promise gave her an opportunity to “beat the odds,” she was thrilled. Read the full story by writer Sharon Hong at Cal State Long Beach’s website. 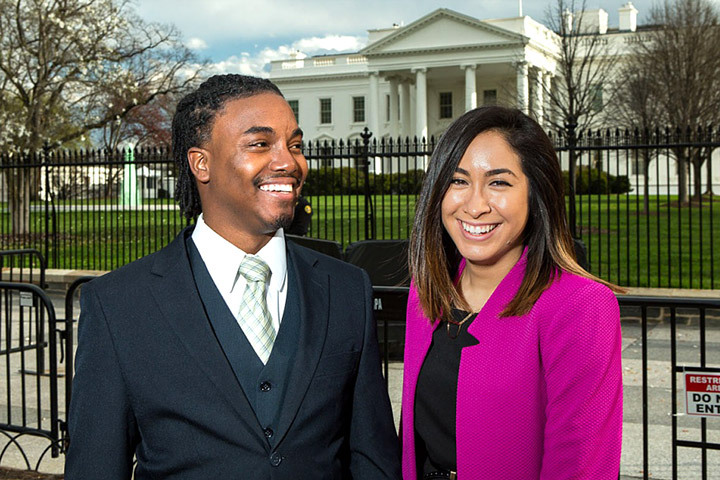 FROM COLLEGE TO THE WHITE HOUSE - Cabrillo High School graduate Keyon Anderson and Poly High School graduate Dominique Vera participated in a White House summit at the invitation of First Lady Michelle Obama.